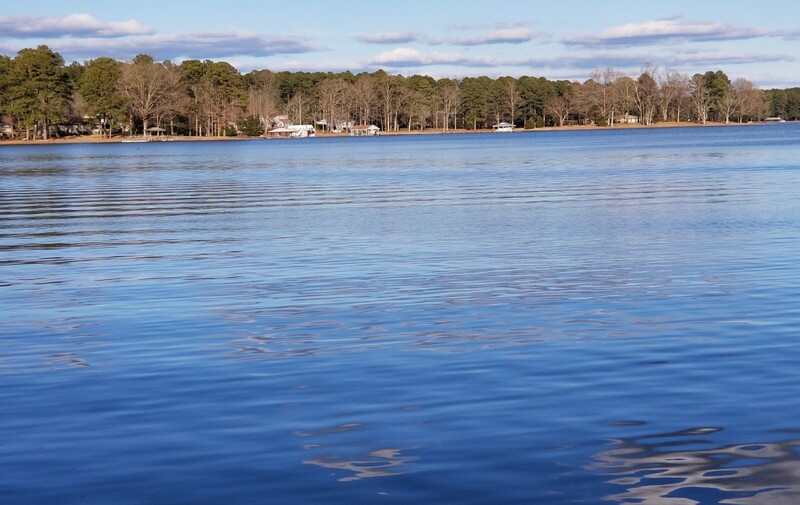 This beautiful three-level Lake Gaston rental home has 2 great rooms, 3.5 bathrooms, an enormous screened porch, and a natural beach to walk into the lake. It’s located on Pea Hill Creek, is decorated beautifully and includes access to a boathouse. The main level has an open floor plan with a great room, a game area, dining room and kitchen which open to a gigantic screened porch. Your family will love the air hockey table and fooseball tables. You’ll love having meals outside, and there is a beautiful seating area perfect for great conversations. Bathrooms can be easily accessed throughout the house, and there is a half-bath which opens to the kitchen. On this base floor, you’ll find the master bedroom has a private bathroom with double sinks, large shower and a garden tub. On the lower level, you’ll find another great room, a kitchen area and dining area. Additionally, here you’ll find another bedroom and full bathroom. With sitting swings for both the young and the old, your family will be able to relax and enjoy the scenery on the lower level patio. On the upper level, there are two bedrooms,and a full bathroom. The lakeside bedroom has a balcony from which you can enjoy viewing the lake. This rental includes kayaks and paddleboats for your family’s enjoyment. Linens and towels are included. The rental period is Sunday through Sunday.